Dubai, in the United Arab Emirates, is a city of excesses, but after spending several days amid the overwhelming noise and busyness of constant construction, visitors may feel a need to get out of town. Take the highly recommended Desert Safari, an adventure only 45 minutes from the city limits but a world away for your senses. It’s an excursion that encompasses all the best of an Arabian desert encounter. Trips begin in late afternoon, when the air has cooled, and take you to a dry, virtually uninhabited environment—a stark contrast to the bustling, well-irrigated city. Hold on for an action-packed adventure riding up and down undulating sand dunes in a 4 x 4 Range Rover (with an adrenaline-charged Emirate native driving). 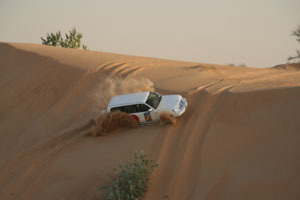 Clouds of red dust engulf the vehicle as it slides sideways down dunes, covering windows and leaving deep skid marks in the sand. For more than an hour, you’ll skim magnificent sand dunes, marvel at geometric wind-swept patterns in the sand, and possibly slow down for a herd of camels crossing the path. 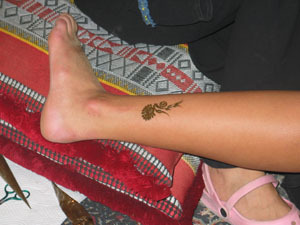 As sunset approaches, you arrive at a camp where activities include a gentle camel ride (getting on and off is the really fun part), sandboarding (similar to snowboarding on dust particles), having a decorative henna design painted on your hand or foot, learning about falconry, sampling a cup of Arabian coffee and sweet dates, or puffing on a shisha pipe (traditional social activity of smoking a flavored tobacco through a hubbly bubbly water pipe.). 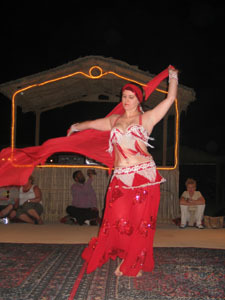 he evening concludes with the performance by a curvaceous belly dancer who invites audience members to imitate her hip action. Finally, distant lights illuminate the camels as they head back across the dunes, a spectacular sight and the perfect ending to this desert adventure.